Sometimes, I get a food craving. A really really strong, can’t-think-about-anything-else food craving where I actually have to abandon all other eating plans and satisfy it. 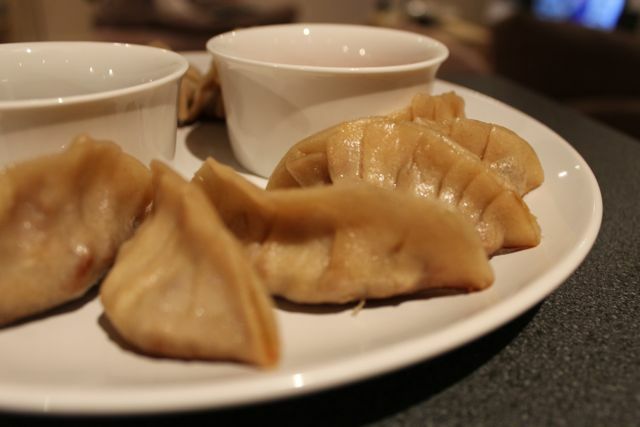 This happened the other day with Japanese gyoza. I was chatting innocently to the girls at work about the wonders of Wagamama and how I hadn’t been in ages. When I used to work in Basingstoke I would go quite often as the restaurant was about 5 minutes from my office but since I started my new job, I haven’t been once. Which is very, very distressing. Although, I did get into the quite expensive and extremely calorific habit of just grabbing a take-out box of my favourite dish Amai Udon on my way back to the office, after a lunchhour spent browsing the shops. Not very good at all! So maybe it isn’t such a bad thing that I’ve had to go cold turkey, on reflection. Anyway. Myself and Ben had a gig on the Saturday (this was the Thursday) IN Basingstoke and although I knew we should go somewhere cheap for dinner beforehand, the lure of Wagamamas was extremely strong and quite difficult to ignore. I realise that to most people Wagamamas is a cheap option, however, last time we went I accidentally got two side dishes* AS WELL AS my main meal, plus we both had wine and beer. So the bill was like £50. Not even slightly cheap. *I find it really hard not to order the gyoza when I visit Wagamamas and then I saw they had salt and pepper squid so obviously I had to get that too. In my defence. So I was chatting to the girls at work about how amazing the food at Wagamamas was and what a shame we were going to Wetherspoons instead in order to keep costs down, when the craving hit me. Hard, suddenly, and out of the blue. I had to have gyoza. Right now. This was like 5pm so as I drove home I was mentally rifling through our cupboards to see if we had anything remotely Japanese-y that I could make gyoza with. We actually had baked potatoes and veggie chicken kievs on the meal plan for that night, but that went out the window and it was all about the Asian food. 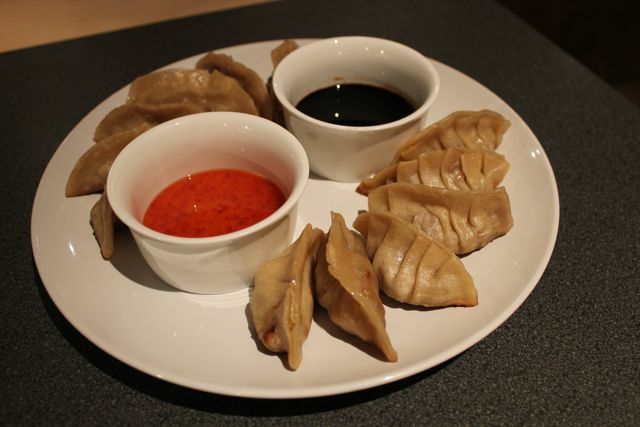 I remembered seeing The Hairy Bikers make gyoza a couple of weeks before on their new gourmet cooking show and it looked so easy! I Googled the recipe and lo and behold, water and flour!!!! Easy peasy pie. I whipped up a batch of dough (if you can call it that) and left it out to prove for a bit whilst I made a filling. We didn’t have any ginger or rice wine vinegar or anything helpfully Asian like that so I had to make do with sesame oil, garlic and soy sauce. 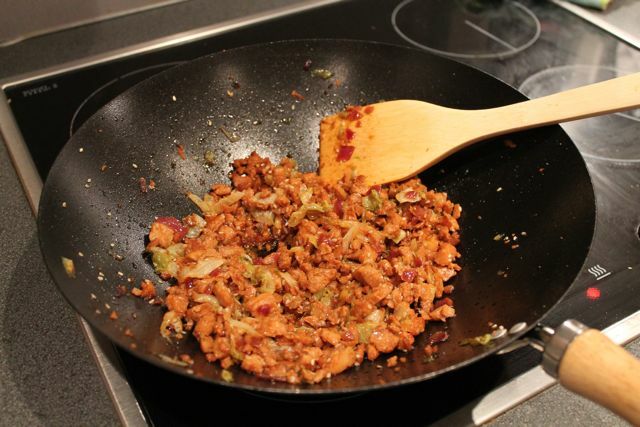 I defrosted some Quorn chicken chunks, chopped them up into small pieces and chucked them in our wok with some garlic and sesame oil. I then added shredded lettuce (cabbage would have been much preferred but we didn’t have any!) and some chopped red onion. I fried it all for a few minutes before tasting it and I actually couldn’t believe how nice it was! I was seriously impressed with myself. The dough had been proving for about half an hour and it was ready to go. I divided it into 4 pieces (having halved the original Hairy Bikers recipe as I didn’t want to make enough for 8 people!) and rolled each section out super duper thin, with plenty of flour. 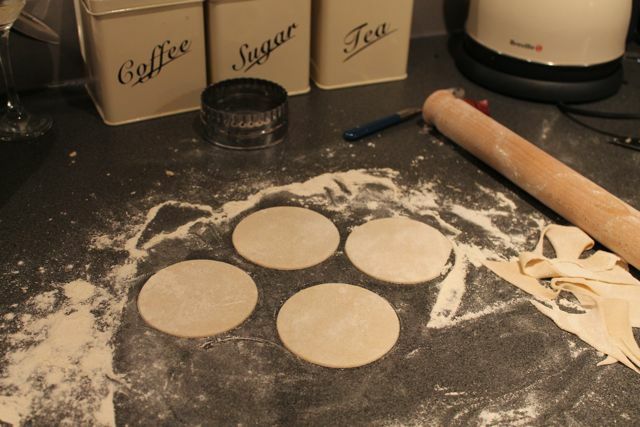 I then used my cookie cutter to cut nice round circles out and stacked them all up into a pile, with flour in between each disc so they wouldn’t stick. Benj was eager to help with the gyoza making so after a brief viewing of ‘How to Make Gyoza’ videos on Youtube, we felt ready to give it a go. And, honestly, it was so unbelievably easy!! I couldn’t believe it! We had the whole stack of about 28 gyozos done and dusted in about 15 minutes! You take a disc, rub cold water around the edges and put a small spoonful of filling in the middle. It is then just a case of folding the dough around the filling and pleating it all the way, which sounds hard but once you’ve watched someone else do it, you’re sorted! 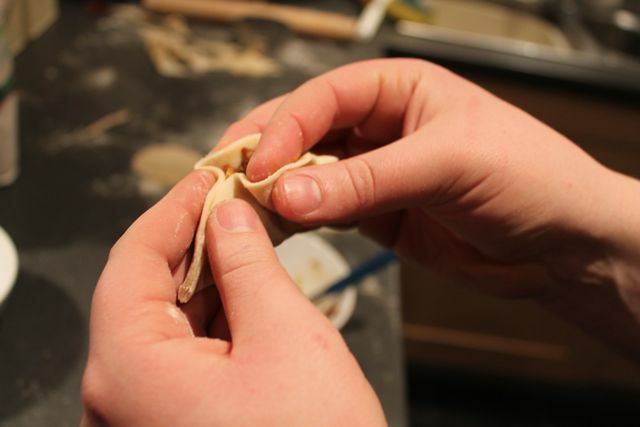 Ben’s hands expertly pleating the gyoza dough. Here is around half the batch we made, sitting pretty in the frying pan about to be seared! 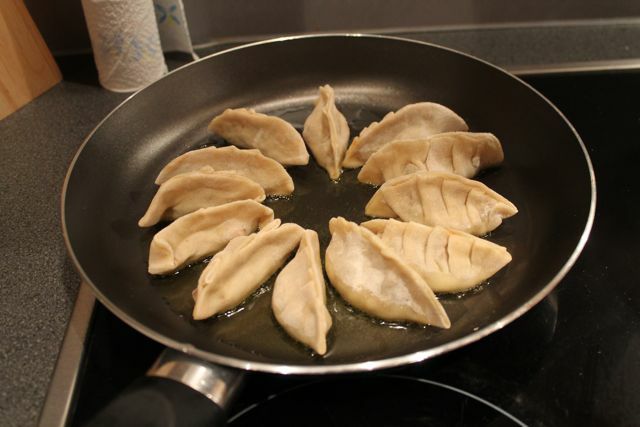 You need to sear the gyoza on the bottom until they are golden brown and crispy, before steaming them. This is a very important step! 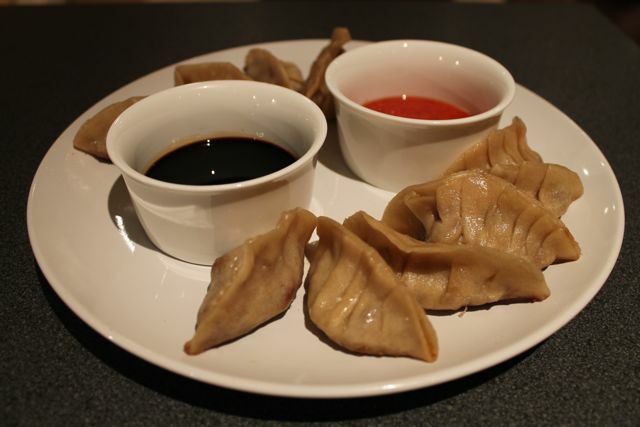 Otherwise you’ll have soggy gyoza! Surely everyones worst nightmare?? I know it’s mine. I seared them for about two minutes on a high heat. Oooh, they smelt so good! I then turned the heat right down and added 100ml of water to the pan. It hisses and spits a bit so be careful! I got Ben to add the water as he’s brave like that 😉 I put the lid on the pan and steamed the gyoza for another two minutes before serving them with dipping sauces; soy sauce and sweet chilli and garlic. Both were lovely but soy sauce always wins for me! We were so unbelievably proud of our creations, they could have come straight from the Wagamama kitchen!! 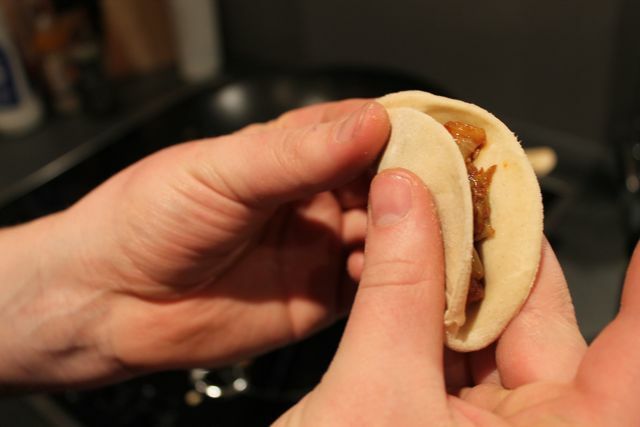 The bottoms were crispy and crunchy and provided a lovely contrast to the slightly gooey texture of the steamed dough. The filling tasted delicious with the extra cooking time and I can’t recommend it enough! I was so impressed with the ease and simplicity of these treats and how professional and restaurant-y they turned out.